Very effective purification of water. 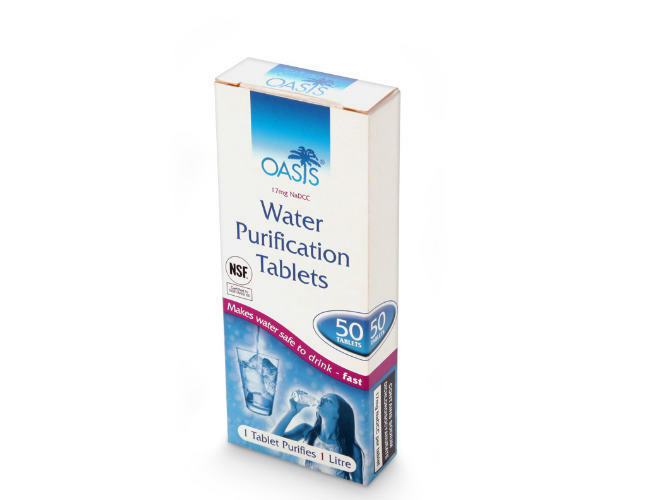 Fizzy chlorine tablets for emergency use.Purification tablets will make water safe for drinking,cleaning cuts, washing fruit, cleaning teeth and veg.They kill water-borne organisms that cause stomach disorders like diarrhoea,typhoid cholera and others.The Oasis Water Purification tablets have an organic chlorine donor with greater disinfection capacity to sodium hydrochloride. Effervescent chlorine tablets are used by the World Health Organization. A 17mg per tablet is twice the minimum recommended, this will provide 10 ppm available chlorine when added to 1 litre of water.